Wow! 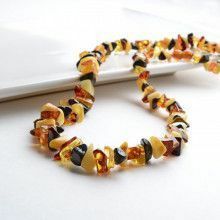 This natural amber Aphrodite choker necklace features an assortment of different colors of authentic amber stones from the Baltic Sea in Russia. Each stone holds its own unique-ness and all the larger stones have a flat bottom, for comfort while wearing the necklace. 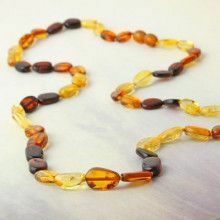 The largest amber stone measures about 40 mm in length, and the smallest measures about 12 mm long. Hidden barrel clasp.